Founded in 1981, by John Sortino who sold hand crafted teddy bears in an open-air market in Burlington, Vermont. Sortino happened upon the idea of packaging and selling bears through the mail when a tourist visiting Burlington wanted a bear mailed to her home. The concept was called the “Bear-Gram” which features the customized teddy bear placed in a box, complete with ‘air-hole'” and stuffed with other goodies. By 1995, the company moved it’s headquarters to Vermont’s Champlain Valley. They have 2 factories: one in Shelburne and one in Newport. The Shelburne factory is an especially popular tourist destination and also a concert site for the Vermont Mozart Festival. Today, Vermont Teddy Bear Company is one of the largest producers of teddy bears and the largest seller of teddy bears by mail order and internet. The company handcrafts each of it’s teddy bears. For more info see the link above to their website for a large selection of bears, bears and PJ Combos, bears for all occasions and more including factory tours and events. In 1990 ,while visiting and researching lighthouses on New England Coast. Tim Harrison and Kathy Finnegan soon learned that nothing symbolizes the maritime history of our country more than the lighthouses and the keepers who served them. In 1991, Tim and Kathy published their highly successful book The Lighthouses of Maine and New Hampshire. In 1992 they started a monthly publication “lighthouse Digest” and shortly thereafter opened the gift store in Wells, Maine. Don Devine also came on board and helped them expand their store and catalog business. Today, Lighthouse Digest has thousands of subscribers in every state and twenty countries. The Lighthouse Depot is a store like no other! Two floors of lighthouse collectibles and gifts that they have searched the world for. If you have not had the opportunity to visit the store a selection of their items can be seen online. The shop was featured on PBS TV’s legendary lighthouses. You can find all kinds of lighthouse items including their own Harbor Lights collectibles, Home Decor, bedding, kitchen and bathroom, clothing, gift ideas and more! There are always new products and exclusive items. You can also view Lighthouse Explorer a link on their site that features thousands of stories and photos of lighthouses from around the world. Lighthouse Depot provides support to various lighthouse foundations. This is the story of cards that talked to me! Have you ever seen something different and creative and just wanted to embrace it by buying several different selections of the product? That’s how CAPE CARD will make you feel…These “Cod Cards” just make you smile and feel good! No wonder they are known as “Unique Art Treasures from Cape Cod”. and quickly expanded into “The Hallmark of Cods”. Cape Card’s use of illustration and sense of humor to create a wide range of images for a multitude of applications. 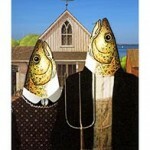 Artist and Designer; Andrew Newman has given the ubiquitous cod a place in the world of art and humor! Note-cards, prints & posters, “Postcods”, stickers and a calendar. The selections to choose from will just make you smile and we bet you’ll want to purchase several…not only for your own personal use but as gifts for someone on your list. The Cod Fish has found new life on Cape Cod! Cape Cards are available at 11 shops on the Cape as well as online. For more information on how to find Cape Cards please take a few minutes to view their website by clicking the link in the 1st paragraph. We think you will be glad you did!